The Spartans home games are played at Spartan Stadium, which is located on the main university campus. Spartan Stadium has ranked among the NCAA's Top 25 in attendance for 59 consecutive seasons, from 1953 through 2014. The Spartans' current coach, Mark Dantonio was hired on November 27, 2006. The team's iconic Spartan helmet logo has been ranked as one of the game's best. During the 1950s when Detroit was known as the world's leading automobile manufacturer, Michigan State was often referred to as the nation's "football factory." 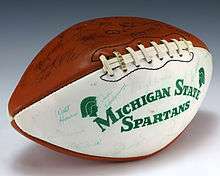 During this era, the Spartans produced great players such as Lynn Chandnois, Dorne Dibble, Don McAulliffe, Tom Yewcic, Sonny Grandelius, Bob Carey, Don Coleman, Earl Morrall and Dean Look. In 1951, the Spartans finished undefeated and untied to claim a share of the national championship with Tennessee. A second consecutive undefeated season led to a consensus national title in 1952. The team was admitted into the Big Ten as a regular member in 1953, winning the league championship and defeating UCLA in their first Rose Bowl game. After the 1953 season Biggie Munn, the Spartan coach, turned the team over to his protégé Duffy Daugherty. On November 27, 2006, Mark Dantonio was hired from the University of Cincinnati to become Michigan State's new men's football head coach. In 2010, Dantonio led MSU to earn a share of the Big Ten Championship after finishing the year in a three-way tie with Ohio State and Wisconsin, and an out right Big Ten Championship in 2013 & 2015. He has a 7-3 record against the University of Michigan (UM). Michigan State's streak of 4 wins in a row, from the 2008-2011 seasons, tied Michigan State's best in the rivalry. Dantonio's record also includes a 4-4 mark for the Megaphone Trophy, which goes to the winner of the MSU vs. Notre Dame rivalry football game. Dantonio served as an assistant coach at MSU from 1995-2000 and was Ohio State's defensive coordinator during their 2002 national championship season. Dantonio was also an assistant at Kansas and Youngstown State University. He is considered a defensive-minded coach and has been on the coaching staffs of Glen Mason, Jim Tressel and Nick Saban. When Saban arrived in East Lansing, Michigan prior to the 1995 season, MSU had not had a winning season since 1990, and the team was sanctioned by the NCAA for recruiting violations committed under his predecessor and former mentor, George Perles. After returning from US Army active duty, Perles returned to Michigan where he enrolled at Michigan State University and played football under legendary coach Duffy Daugherty. Perles played the 1958 season before his playing career was cut short by a knee injury. Perles then started his football coaching career as a graduate assistant at Michigan State before moving on to the high school ranks in Chicago and Detroit, where his St. Ambrose High School team won their first Detroit City League Championship in 1961. Perles returned to Michigan State as defensive line coach under his mentor, Daugherty. Perles returned to Michigan State University on December 3, 1982. In 12 years, he led the Spartans to two Big Ten Conference titles, seven bowl games and a victory in the 1988 Rose Bowl. The 1987 season marked the Spartans' last outright Big Ten title until 2013. During the 1987 season Perles and Michigan State beat Southern Cal twice in the same season, once in the regular season and one in the Rose Bowl. Duffy Daugherty (September 8, 1915 – September 25, 1987) replaced Biggie Munn in December 1953, following Munn's retirement to become Michigan State's athletic director. Daugherty would serve as the head coach at Michigan State University from 1954 to 1972, where he compiled a career record of 109–69–5. Duffy's 1965 and 1966 teams won national championships. Duffy's tenure of 19 seasons at the helm of the Michigan State Spartans football team is the longest of any head coach in the program's history. He was inducted into the College Football Hall of Fame in 1984. 1965–1966 The 1965 and 1966 seasons were the high points in Daugherty's coaching tenure, if not in the history of Michigan State football. The 1965 team finished the regular season 10–0 and ranked first in the country, but was upset by UCLA in the 1966 Rose Bowl, 14–12. Nevertheless, Michigan State was named national champions by the UPI and the National Football Foundation. The 1966 team began the season 9–0 and headed into their final game ranked #2 against #1 Notre Dame at Spartan Stadium on November 19. The #1 vs. #2 showdown, dubbed the "The Game of the Century" by national media, ended in a 10–10 tie. The Spartans did not play in a bowl game following the 1966 season due to Big Ten rules in place at the time that prohibited its teams from playing in the Rose Bowl in consecutive years and barred participation in any other bowl. Notre Dame and Michigan State were declared co-national champions of the 1966 season as a result of the 10-10 tie. Clarence Lester "Biggie" Munn (September 11, 1908 – March 18, 1975) was head coach of Michigan State from (1947–1953). His 1951 squad and 1952 squad won national championships. Munn retired from coaching in 1953 to assume duties as Michigan State's athletic director, a position he held until 1971. Each year, the Michigan State Spartans football team hands out the "Biggie Munn Award" to the team's most motivational player. MSU's Munn Ice Arena, built in 1974, is named in his honor. Munn was inducted into the College Football Hall of Fame as a coach in 1959, and, in 1961, he became Michigan State's first inductee into the Michigan Sports Hall of Fame. He authored the coaching textbook Michigan State Multiple Offense in 1953. 1947–1950 In 1947, Munn and the Michigan State administration, led by university president John A. Hannah, approached Notre Dame president Father Cavanaugh to have his Fighting Irish play the Spartans for the first time since 1921. MSU initially offered to let Notre Dame take 80 percent of the gate, but Cavanaugh insisted they split the receipts down the middle. Munn was the only coach to beat Notre Dame head coach Frank Leahy three years in a row (1950–1952). Starting with a 33-14 win over William & Mary in East Lansing on October 14, 1950 Biggie Munn start his historic 28-game winning streak. 1951 The 1951 Michigan State Spartans football team went undefeated and were elected the National Champions by the Helms Athletic Foundation; however, the rest of the polls voted for the Tennessee Volunteers, who lost in the Sugar Bowl to the Maryland Terrapins, but post season games did not count back then. * The Big Ten split into the Leaders and Legends Divisions with the addition of Nebraska for the 2011 season. Michigan State played in the Legends Division from 2011-2013. In 2014, with the addition of Maryland and Rutgers, the divisions were realigned and Michigan State now plays in the East Division. In 2005 the university finished a new $64 million expansion project to Spartan Stadium. It featured the addition of nearly 3,000 club seats in the "Spartan Club," 24 suites and a 193-seat press box, bringing the current stadium capacity to 75,005. The original World War II-era terracotta cast of the "The Spartan" statue was moved indoors to the atrium of the new structure to protect it from the elements and occasional vandalism, and a new bronze cast was made for outdoors. The 200,000-square-foot (19,000 m2) addition also houses the MSU Alumni Association, University Development and other units. At the completion of the 2014 season, Michigan State's all-time record is 670–439–44. 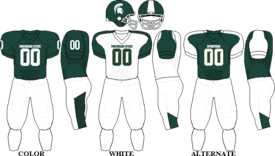 Michigan State claims a total of six national championships, three of which are consensus national championships after being declared the national champion by the AP and Coaches' Poll in 1952, the Coaches' Poll in 1965, and the National Football Foundation in 1966. The Megaphone Trophy is awarded each year to the winner of the football game between the University of Notre Dame and Michigan State University. The rivalry includes games such as the Game of the Century, arguably the greatest college football game ever played. Notre Dame leads the series 48–29–1. The Megaphone Trophy series record is 34–27–1 in favor of Notre Dame. Michigan State currently holds the trophy after a 36-28 win in South Bend in 2016, which is the last time these teams have played in the series. The Old Brass Spittoon is presented to the winner of the Indiana–Michigan State football game which was first presented in 1950. Michigan State currently leads the all-time trophy series 45–12–1. After facing each other in one of the so-called protected cross-division rivalry games from 2011 to 2013, MSU and Indiana will continue to face off each year as members of the Big Ten East division starting with the 2014 season. The Spartans held onto the Old Brass Spittoon from 2007 to 2015, but lost it in 2016 with a 24-21 OT lost in Bloomington. The Land Grant Trophy is named so because Penn State University and Michigan State University are the nation's oldest land-grant universities, both founded in 1855 (Michigan State on February 12 and Penn State on February 22). When Penn State joined the Big Ten Conference in 1993, the Nittany Lions and Spartans have played each other for the trophy in the last week of conference play until the 2010 season. The trophy, designed by former Michigan State coach George Perles, features pictures of Penn State's Old Main and Michigan State's Beaumont Tower. The series is tied 14–14–1. After spending the 2011 to 2013 seasons in opposite Big Ten conference divisions, MSU and PSU resumed playing each other annually for the trophy in 2014. Michigan State is the current holder of the Land Grant Trophy after beating Penn State 55-16 in East Lansing, MI on November 28, 2015. Interestingly enough, the game was not shown live on national TV. Each team was allotted one national television appearance and two regional television appearances each season. Notre Dame had used their national TV slot in the season opening game against Purdue. ABC executives did not even want to show the game anywhere but the regional area, but pressure from the West Coast and the South (to the tune of 50,000 letters) made ABC air the game on tape delay. 1 Although Hannah did not play for the Spartans, the University retired #46 as a recognition to his 46 years of service to the institution. The following former players are in the NFL. ↑ "Color Palette–The MSU Brand". Michigan State University. 2015-09-01. Retrieved 2015-09-13. ↑ Grinczel, Steve. (2003). They Are Spartans. Charleston, South Carolina: Arcadia Publishing. ISBN 0-7385-3214-2. p. 9. ↑ Infractions Case: Michigan State University, NCAA Register, October 7, 1996. Accessed May 15, 2008. ↑ "Michigan State In the Polls". College Football Data Warehouse. Retrieved 2008-12-16. ↑ College Gridirons, Spartan Stadium. Accessed 2006-06-23. ↑ "Michigan State Official Athletic Site - Facilities". Msuspartans.com. Retrieved 2011-10-14. ↑ "2010 National College Football Attendance". NCAA.org. Retrieved 2011-10-14. ↑ "Newsroom Special Reports". Special.news.msu.edu. Retrieved 2011-10-14. ↑ "Spartan Football Student Section Expands - MICHIGAN STATE OFFICIAL ATHLETIC SITE". Msuspartans.com. 2008-07-15. Retrieved 2011-10-14. ↑ "Fans can vote for 2011 football student section T-shirt | MSU News | Michigan State University". News.msu.edu. 2011-06-09. Retrieved 2011-10-14. ↑ "Scout.com: BOWLS (12/5) - TTech vs. NW, Baylor vs. Ill". Cfn.scout.com. 2010-12-05. Retrieved 2011-10-14. 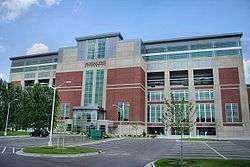 ↑ "Michigan State Spartans Football Schedules and Future Schedules". Fbschedules.com. Retrieved 2011-10-14. ↑ Mike Celzic. The Biggest Game of Them All: Notre Dame, Michigan State and the Fall of 1966. ISBN 0-671-75817-9. ↑ "Big Ten retired football jerseys"
↑ "College Football Schedules, Scores, News, Predictions, and Rankings". AthlonSports.com. 1982-12-06. Retrieved 2011-10-14. ↑ FBSchedules.com, Michigan State Spartans Football Schedules and Future Schedules. Retrieved August 23, 2014.